Synopsis (via Goodreads): Set in a darkly glamorous world, The Gilded Wolves is full of mystery, decadence, and dangerous but thrilling adventure. 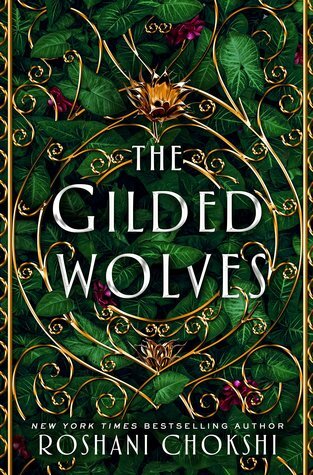 I almost gave up on The Gilded Wolves, but things improved as I kept reading. The story reminded me of both The Da Vinci Code and Ocean's Eleven, but written for a younger audience. The aspects of the story that included symbolism and mathematical equations sometimes felt a little far-fetched, but they were intricate and difficult enough to be believable. The characters had to actually work for their answers, and solutions didn't fall into their laps. 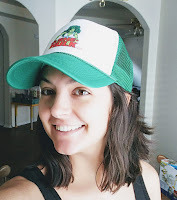 However, I didn't always understand why Forged objects worked (or how), but I ignored the part of my brain that wanted a clearer understanding of the information being presented. 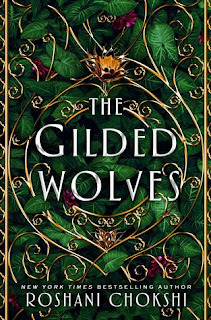 Speaking of information, The Gilded Wolves really overloaded my brain at the beginning, and then periodically throughout the book. I want an author to show me how their world works, because a lot of new information can be overwhelming and difficult to process. I would rather feel like I'm a part of the story, which is hard to do when I'm having trouble understanding how the world works. Additionally, some of the chapters in this book started with archival records from the Order of Babel, and the information only added to my confusion (random names and dates that dealt with Babel fragments and Forging). There were also a lot of inconsistencies that I wasn't a fan of. For example, the rings are supposedly melded to the skin and impossible to remove (unless by force), which is why the first chapter happens the way it does. However, towards the end of the book, everyone is taking their rings off like it isn't an issue at all. I thought they had to literally be cut from the skin? If you've read this, did I miss something along the way? Really, everything about the house rings was confusing. I did like watching everyone work together, and learning about all of their individual quirks. Hypnos was charming and instantly a favorite! It was clear he was lonely and looking for friendship, but the group was distrustful of anyone within the Order. Also, now that I think about it, he said the Order monitored his every movement outside of his house (and even wore a recording device for their benefit), but after a certain point he never seemed to have one on. Did the Order suddenly not care about his whereabouts? As for the ending, I didn't like it. I felt betrayed by the author, and didn't appreciate how she handled something regarding one of the characters. There's also a cliffhanger, but it wasn't one that left me wanting more. I was annoyed with Severin and his decisions, confused about why he's able to attend the big meeting that's coming up, and angry at the way he's treating his friends. I understand that he's in pain, but he's picking at the wound instead of letting it heal. It went against what I thought I knew about Severin. In all honesty, I feel like I know very little about the characters, except for what they achieved during this book. Books like this are always hard for me to review, because on the one hand I liked it enough to finish the story, but there were still a lot of things that rubbed me the wrong way. I enjoyed watching everyone worked together to crack codes and riddles, but I didn't always like how they handled their personal relationships and goals. If The Gilded Wolves sounds like something you'd enjoy, go for it. I thought the overall story was incredibly imaginative and fun to experience. It sounds like there's a lot presented that you're expected to just "go along with" - without explanation. Not sure how well that would work for me. And with a disappointing ending... nope. Total deal breaker. I always feel like I have this unwritten bargain with an author: I buy your book, I read your book, therefore you are required to give me a satisfying ending. LOL When that doesn't happen I feel totally cheated. I don't mind a cliffhanger but it needs to make sense to the overall story. Sorry this one didn't work better for you but it does sound like the overall story was very creative! I wish some of the major things had been explained in more detail, like the house rings and how Forging actually works. I know the author tried to stagger the Forging information, but I'm still not sure if it's magical, religious, or both. They referred to Babel fragments and quoted the Bible often, but I don't know how everything tied together. I really, really wanted to understand, because I think that would have greatly improved my overall enjoyment of the book. Something really awful happens at the end of this book, but it felt rushed and unnecessary. I have no idea why it happened, or how it was able to occur in the first place, but it felt too convenient. And then more secrets are revealed, but of course those aren't addressed either. It was very unsatisfying, to be honest. I wanted more from the characters and their story. I thought the idea was great but it really wasn't a book for me. I really liked the concept for this book, but I'm not sure if it's a series I will continue in the future. I didn't like how things ended, and I felt like the characters could have been a little more developed. I wanted to know about their individual stories! I thought this book sounded really interesting, but I'll have to keep your criticisms in mind if/when I pick it up. World-building is such a tricky thing. It is! It's hard to fully enjoy a book where there is too much or too little information. There's a delicate balance to world-building, and it can be a beautiful thing when done well. <3 I hope you enjoy this one if/when you decide to read it! The premise is really interesting, but some other things fell flat for me.